Here in our region we combine several red chiles to foreground the flavor of the meat, whether that be the traditional native venison, or the more recent (1500s) imported meats like beef or pork. 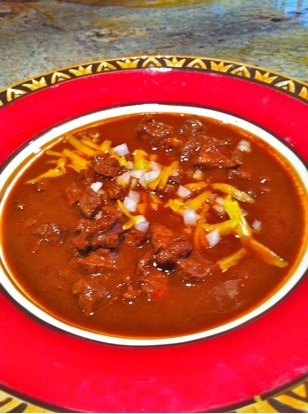 It’s a cool day here in Houston and making Carne Con Chile, aka “Chili,” just feels like it’s the right thing for body and soul. This recipe is one I hope you will like. I use Ancho chiles as the base, Guajillo for red color, and Chipotle for a nice tang. The other seasonings are a classic Texas Mexican combination that I think blends perfectly such that you don’t have one flavor springing up over any other. 1. Place all the chiles in a large saucepan, cover them with water and bring to a boil. Turn off the heat and let the chiles cook for 15 minutes. 2. Heat a comal or a cast iron skillet on high, then roast the onion and the garlic until the onion has softened and has black spots. Peel the garlic after it has cooked and become soft. 3. Cut the the roast into 1/2″ cubes or smaller, trimming off the fat as you go. This is a time- consuming task, so if your butcher is friendly she might agree to do this for you when you buy it. 4. Add 1 Tablespoon Canola to a skillet on very high heat and quickly brown the meat for only 5 seconds or so. Set aside. 4. In a blender, place the chiles and all the spices. Add about a cup of water and blend on high to make a very smooth purée, adding additional water as necessary. If there are flecks in the purée, strain through a fine mesh sieve. 5. Heat a dutch oven (cast iron if you have one, but not necessary) on medium heat, add the oil and then “fry” the chile purée. Be prepared for some splatter. Cook for 10 minutes, stirring all the while. 6. Add the beef and 3 cups of water and bring to a very slow simmer. By this I mean that you’ll see only small, slow bubbles on the surface. Cover and cook for 2 hours, all the while adjusting the heat so that it stays on a slow simmer and does not boil. Uncover and cook for another 30 minutes or so to thicken. Adjust the salt. Serve the carne con chile immediately or the next day with garnish of diced white onion, cheddar cheese, diced and pickled Jalapeños. Make sure you make plenty because it will taste fantastic the following day.